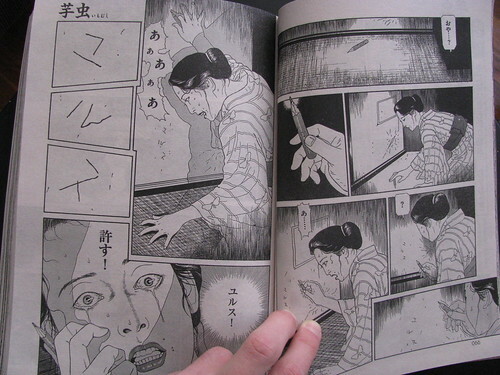 Four months, and four chapters of Suehiro Maruo's sick and exquisite Imomushi. 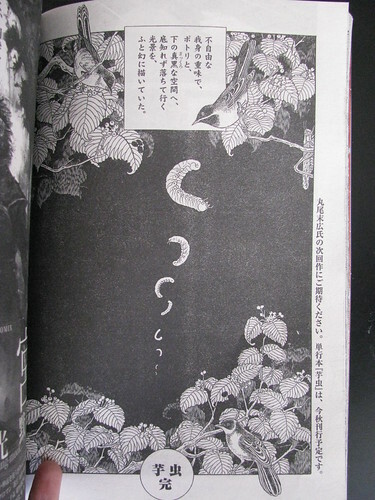 Chapter 4 marks the conclusion of Imomushi, and was published in the September Issue of COMIC BEAM. I was a bit sad to see the story end so quickly, but with such a short story as source material, Maruo was able to weave quite an interesting manga. Most of the substance and tension is stuffed into this final chapter, which is gorier and more violent than 99% of The Strange Tale of Panorama Island. Maruo's adaptation of Imomushi pulls no punches in delivering Edogawa Rampo's bleak tale, though I have to admit the final moments of the story work slightly better in prose than manga form. That said, read as a complete manga, Imomushi is a steamy and great piece of upsetting work. 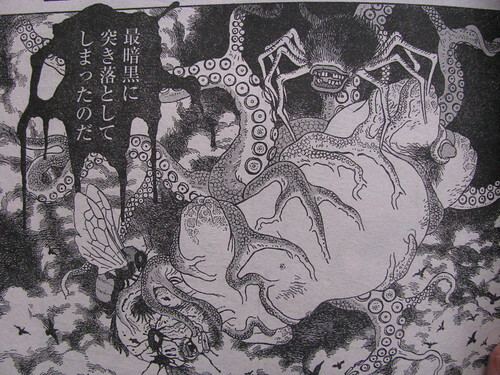 Check out my first post for details on the plot of Edogawa Rampo's short story, The Caterpillar. Things take a turn for the cruel and psycho-sexual immediately. 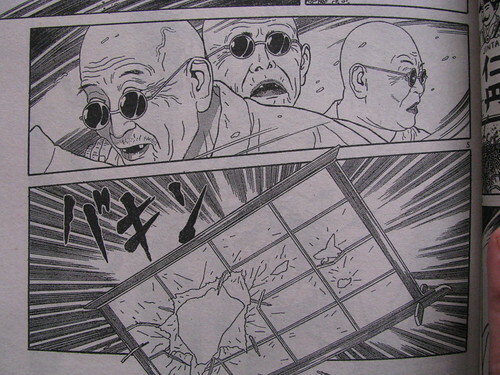 Three blind men in the street; all the secondary characters are super odd and malformed in this manga. The doctor pays a visit, how will Tokiko explain what has happened? That is what I call a moment of realization. So goddamn good, Mr. Maruo! My hat is off to you on this panel. 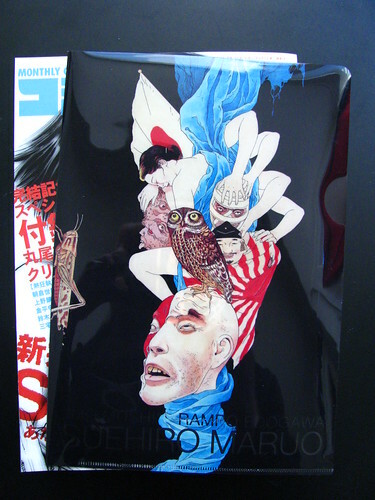 Fans of this golden streak of Suehiro Maruo x Edogawa Rampo, fear not! The author's bio section in the back of the issue mentions that Maruo's next piece (serialized in COMIC BEAM) will be another Edogawa Rampo adaptation/collaboration. I wonder which short story it will be? The Twins? Red Chamber? The Finger? I am guessing whatever Maruo chooses, it will be adapted another 4-chapter manga... with a book collecting it with Imomushi sometime early 2010 in Japan? That is just a guess though, we'll see what happense! Needless to say, I personally strongly hope that Imomushi will have the chance to see publication in English at some point in the future! UPDATE: That was the fastest I've been proven wrong in a while. My buddy Monika posted in a the comments a link to a new release on the EnterBrain site. Seems I was wrong, they are releasing Imomushi as a standalone tankoban this month! 148 pages and the same size as their Panorama Island release. How cool- thanks Monika!! :) Time to send some emails! then I wonder what this will be ?? says it comes out this month! I will update the post! Wait, there's a folder included? Think I gotta pay the Village Vanguard another visit to see if they have this back issue. @Ho-Ling: Yeah, they have it listed as a free "Clear File"-- it was literally rubber-banded into the middle of the issue. Hi, I'm new here. 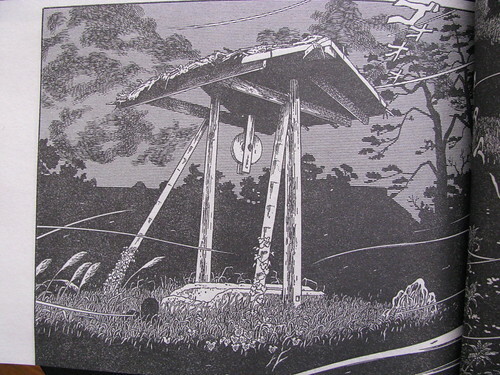 you have a very good blog, I arrived thanks to a year-old post about The Human Clock by Tokunan Seiichiro, amazing work. Question though, where can I download the whole Imomushi (all chapters)? I'm very impressed by what I saw. thanks in advance. @Zaiten: Thanks for checking out the blog! That story you mentioned (Human Clock) was scanned and put up a while back by our buddy Rizzah at Wanted! Cheap Manga. As for Imomushi, we don't post raw scans, so you won't find those files here. Out of curiosity, who did the cover for this issue?